Tool for Professionals. The air at the summit of notebooks is exceptionally thin. Only very few manufacturers accomplish positioning selected models there permanently. 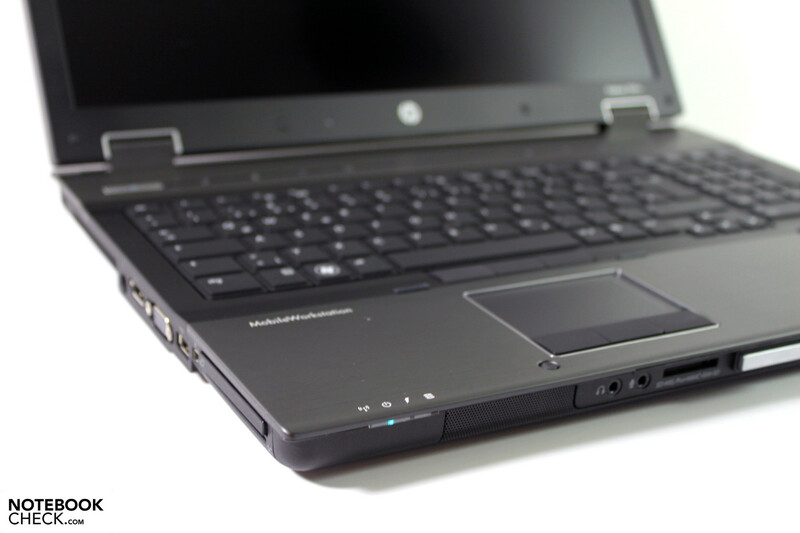 The American manufacturer, Hewlett Packard, pilots the Elitebook 8740w to this position. It includes latest quad core CPUs, high-performance graphics cards and last, but not least, a promise of best rates in many fields due to its Dreamcolor display. 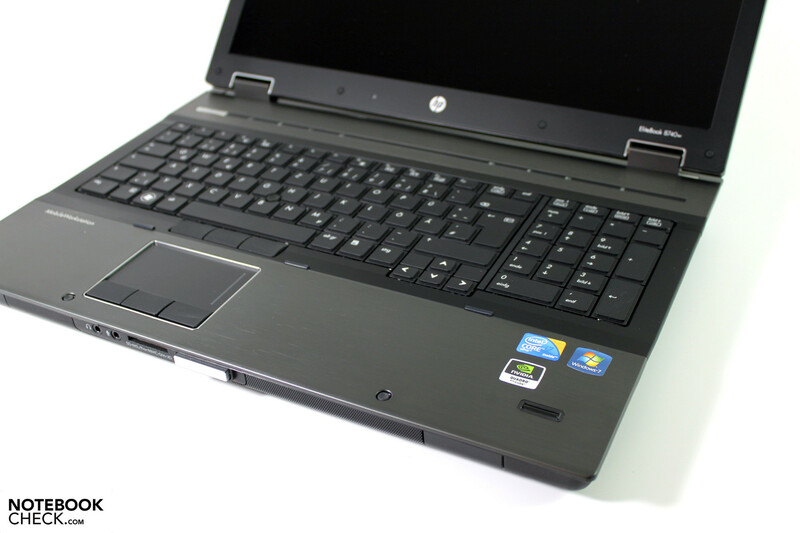 Following the HP Elitebook 8540w, reviewed with both the graphics and the Nvidia Quadro FX880MATI counterpart, FirePro M5800, the HP champion's league makes a special guest appearance in our editorial office. 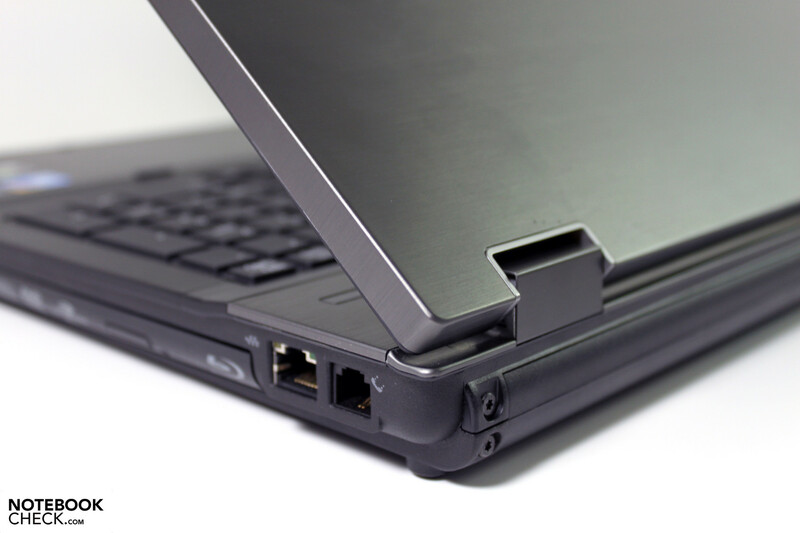 The Elitebook 8740w aims at professional users from a variety of fields, whose various requirements have to be met by a range of configuration options. We'll look closer at a model equipped with an Intel Core i7-820QM processor, Nvidia's Quadro FX 2800M graphics and the gripping Dreamcolor IPS display. The configuration-related data are only partially applicable to differently configured models. 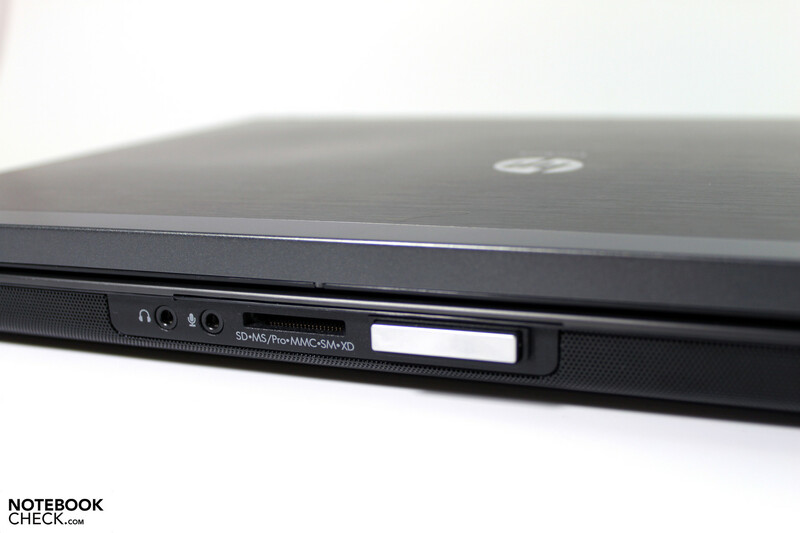 It is practically an identically constructed device as the previously reviewed HP 8540w. However, the current machine differs in its size. The 8740w grants itself a valuable desktop surface of 0.11 m2, with a width of almost 40 centimeters and a depth of about 28.5 centimeters. In return, it also harbors extremely strong hardware. Considering this, the nevertheless very slim base unit is almost amazing. The opened case has a height of just 25 millimeters on the front, measured from the table top, slightly increasing towards the back to just over 30 millimeters. We immediately start battering our brains about temperature management and cooling – but more about that later. 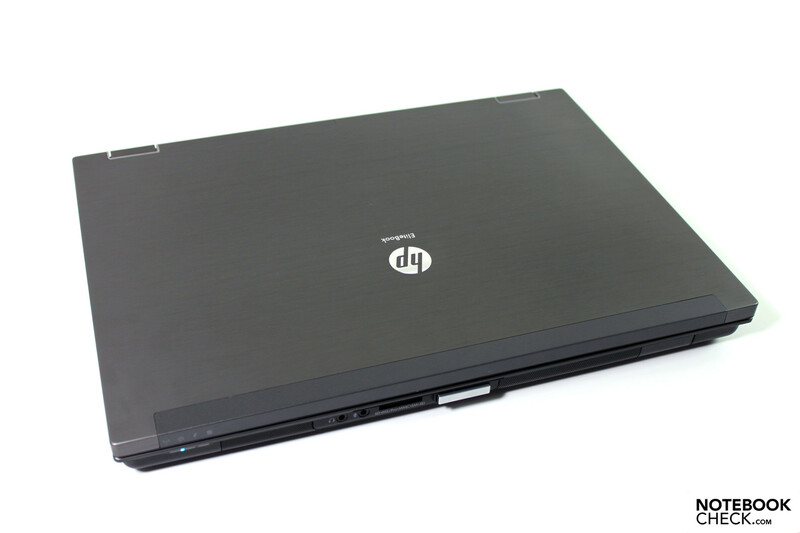 The HP only uses the best for the Elitebook 8740w in terms of materials. 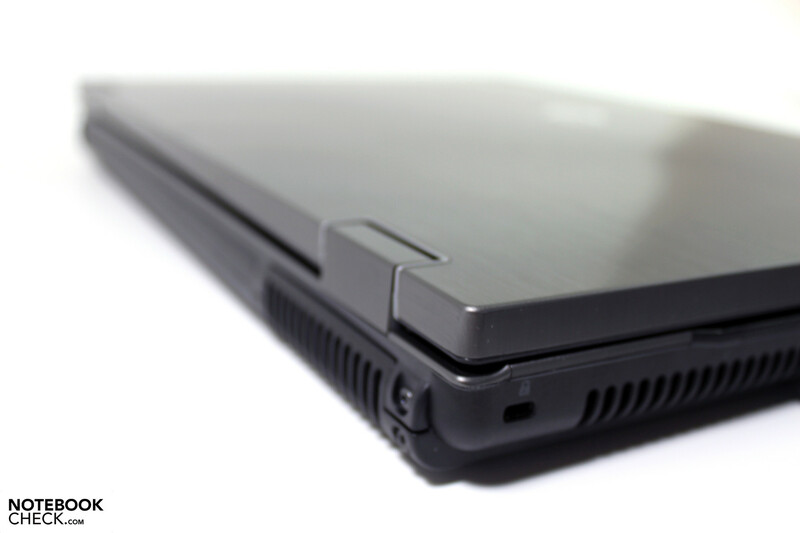 Metal surfaces for the display lid and base unit cover, robust, high-end plastic and a magnesium frame inside the case. However, using expensive materials doesn't automatically endow quality. It's the workmanship that either convinces the user, or not. In the 8740w's case, we have a hard time finding reasons for complaint in this regard. We see narrow gaps, components that fit exactly – no matter where we press or pull, we are completely spared from quality disrupting creaking noises. This takes us to the next rating criterion: case stability. Again, we practically search for reasons to complain without success. Both base unit, as well as display proves to be unimpressed by our pressure tests. The display also shows itself very resistant in view of twisting, which is no surprise at a thickness of up to 12 millimeters. With a weight of 3820 grams, we can only pick the case up with a tight grip on the front edge with great effort. The base unit doesn't seem to mind though – no creaking, no obvious twisting. The notebook lives up to its conceived application purpose in terms of looks. Dark surfaces everywhere, only interrupted by a few blue turquoise colored LED status indicators, mocks modesty in the office. 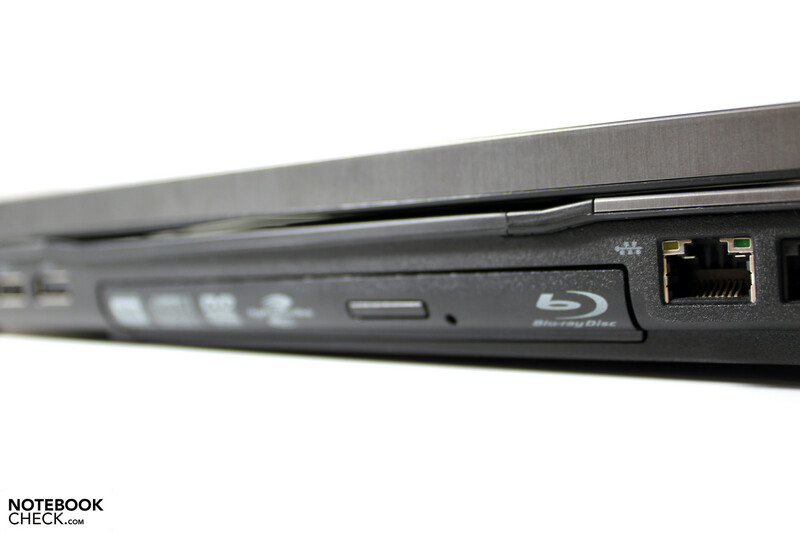 Upon looking closer, you see the brushed aluminum surfaces that bring the notebook back to the top level haptically. Over the massive looking hinges that have a sufficient hold on the heavy display in practically every position, we work our way to the display's upper edge, including the installed webcam. Here, we likely find one of the few, and admittedly controversial "critique points" of the case – the display latch hook. No, inferior plastic has been used here. The ramshorn system even keeps the display very securely in a closed position. It's simply the metal's inelegant mushroom shape that protrudes out of the display. When the display is closed, both thorns are fed into the other side and lock. This can be reversed by pushing the generously sized slider on the notebooks front. Upon that, the display springs open by a few millimeters and emits a few disagreeable noises due to its construction. 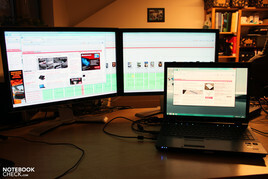 A potential workstation needs one thing in particular: a comprehensive connectivity. 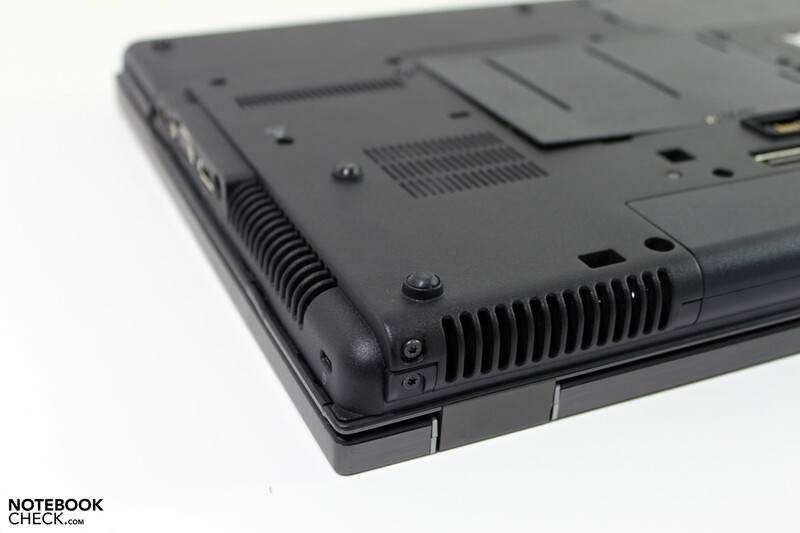 HP puts a lot of ports into the case despite its slimness. The alignment is started by a combination of smartcard reader and ExpressCard slot (incl. dummy) on the case's left. A Firewire 1394a, USB 2.0, VGA, display port and adapter's socket follows. We also find a Kensington lock slot squeezed into the back corner by the air outlet here. 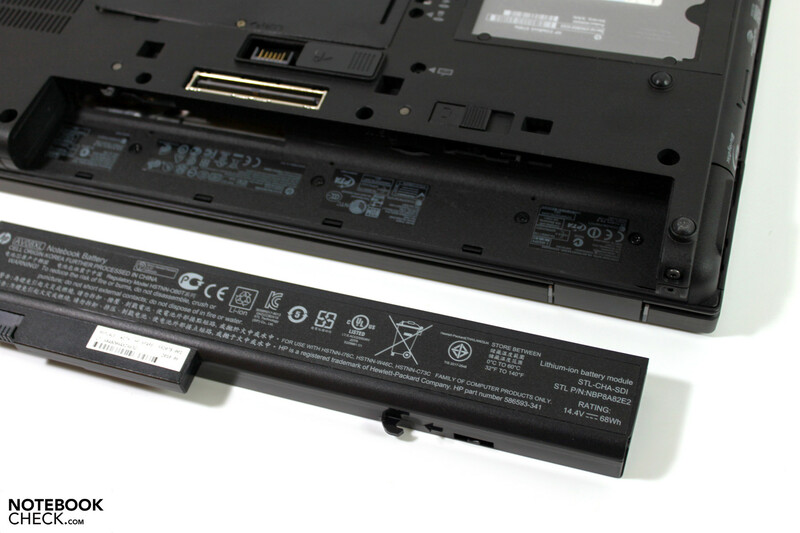 Although the read edge is unfettered because of the standard hinge solution, HP doesn't place any ports here and leaves almost the entire case width to the battery and an air outlet. On the right edge, from back to front, there is the RJ45 LAN port, modem socket, the optical drive, and three more USB ports, two of which are "Superspeed Ports", so USB 3.0 and a USB/eSATA combination on the front corner. The mandatory jacks for headphone and microphone are on the front in the mouse pad's area, where the cardreader (2in1: SD/MMC) is also found. Again, the Elitebook doesn't have to be reproached in terms the given interface circumference. But we do have to judge the port distribution more severely. As can be seen well on the pictures, almost all ports on the left and right are located rather far front – in particular the USB hoard on the right. You might frequently be annoyed about disturbing cables on the case's left or right when the notebook is used without a docking station. However, at the same time, this is the solution. HP obviously tries to do everything to sell an according docking station for the device, for unburdening the sides in stationary use. The following could be a possible alternative (link) that however lays it on thick at a price of about 260 euro RRP (street price of about 150 euro). 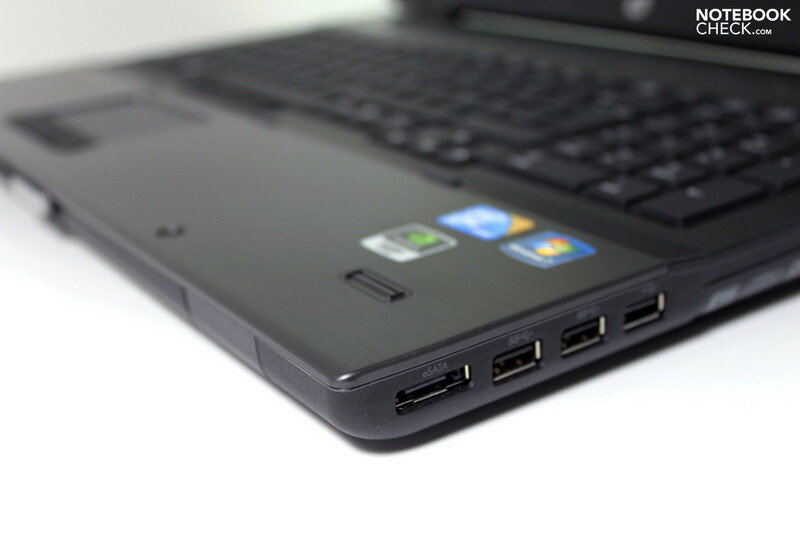 The 8740w would be expanded by four additional USB ports, a display port and DVI port on the docking station's rear. Although expensive, it's definitely to be recommended for stationary use with numerous peripherals in our opinion. If you examine HP's spec-sheet, you'll practically find all communication options that could be interesting for a notebook. Among others, Bluetooth 2.1 and an optional broadband modem with GPS function beside Gigabit Ethernet (Intel 82577LM) and wireless LAN (Intel Ultimate-N 6300 AGN). The built-in 2 megapixel webcam (not in all models) belongs to the available communication. As it's appropriate for a strong workstation, you have the option to modify the existing hardware according to your individual needs. For example, it's possible to upgrade the RAM up to 16 GBs. However, only in quad core models which have four memory bays. "With the Upgrade Bay with Dual Hard Drive support, the optical drive can be replaced with an optional 500 GB 7200 rpm hard drive". This means, if you can live without an optical drive, you can install a second mass memory into this drive bay via a matching adapter and thus implement the above mentioned combination. 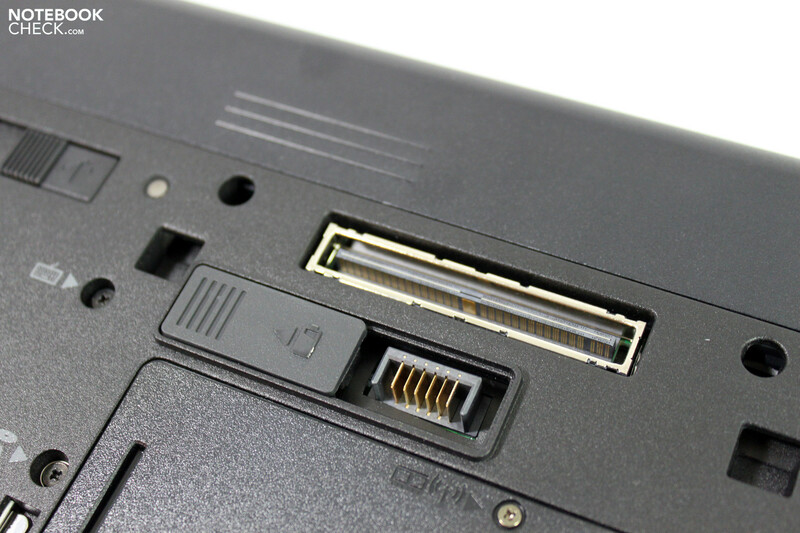 The Expresscard slot bids another expansion option. A variety of functions or interfaces can be retrofitted with various modules (TV, audio, etc.). The battery solution can also be upgraded. There is even a whole range of options available. More about that in the section "Battery Life". An extensive offer of security functions also belongs to pro-workstations' must haves. 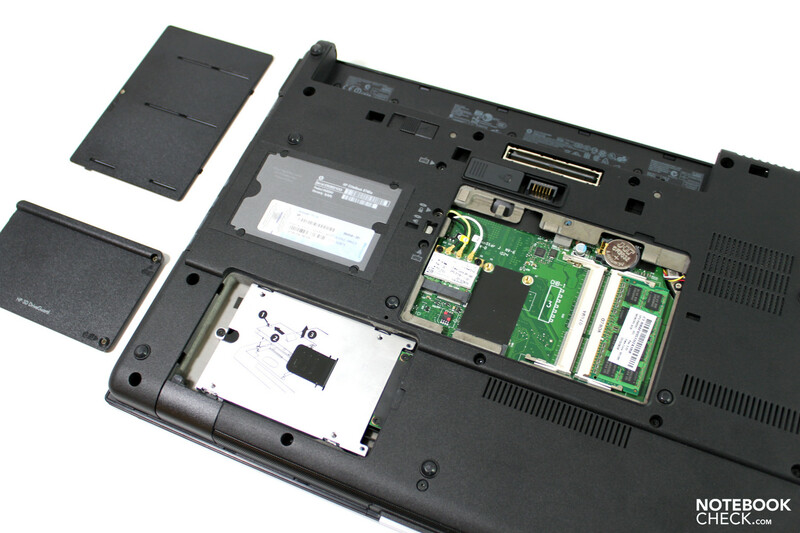 HP includes a range of functions in the 8740w, even if a part is optionally available for a surcharge. 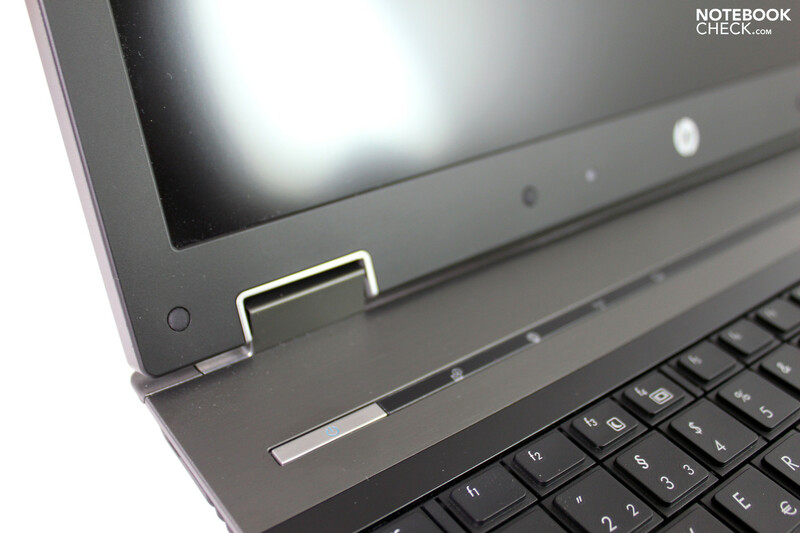 Thus, the notebook has a fingerprint reader, an installed smartcard reader and an integrated TPM 1.2 security chip. Beyond that, the Kensington lock makes it possible to secure the device with common locks against unauthorized removal. But that's not all. If the notebook does fall into the wrong hands, various set passwords, respectively the data encryption on the hard disk could protect against unauthorized data access. HP also provides support via various software tools (HP ProtectTools Security Manager). Support from Computrace LoJack is an especially interesting solution for sensitive data. On the one hand, this software can locate stolen PCs and then, it can remote delete sensitive data during active protection (subscription!). Details about AbsoluteSoftware's offer can be found here. 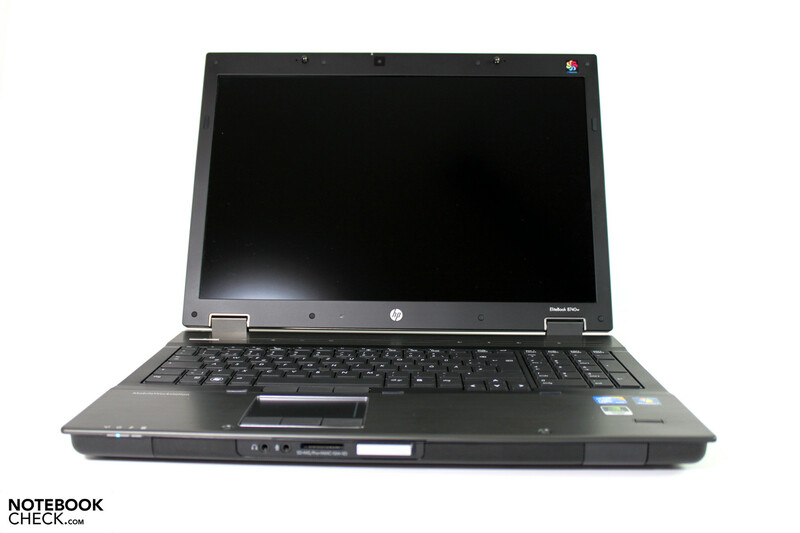 On HP's website in the according accessories section, you can find a vast amount of hardware and software. Apart from the device and adapter with power cable, you'll find a few thinly printed papers and otherwise nothing of real value in the standard scope of supplies. Of all additionally available extensions, the docking solutions and warranty upgrades are particularly interesting. 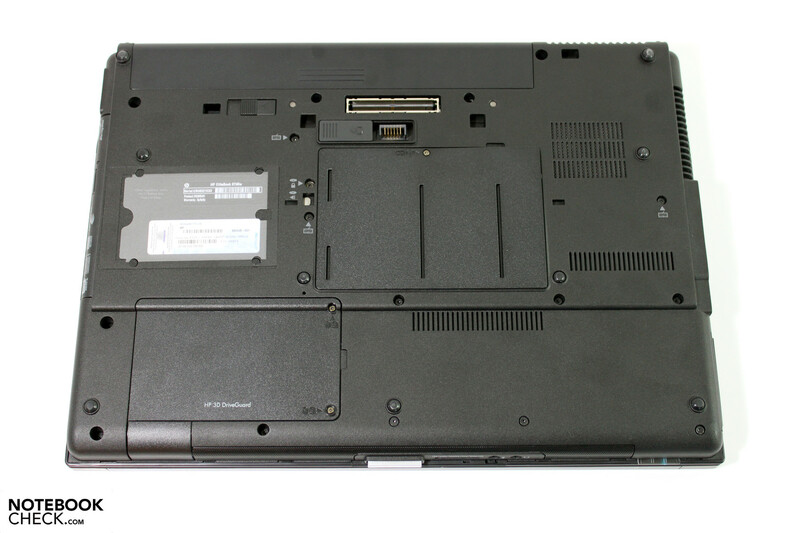 The HP Elitebook 8740w comes with a three year bring in service ex-factory. Thus, the user has to send in the device at his own expense in repair case. However, you can also provide your workstation with a three year onsite service for the next business day (+130 euro), or even an accidental damage protection warranty (+150 euro). At any rate, an onsite service is recommendable for professional users to prevent longer work stoppage. Upgrades up to a maximum of 5 years are possible. 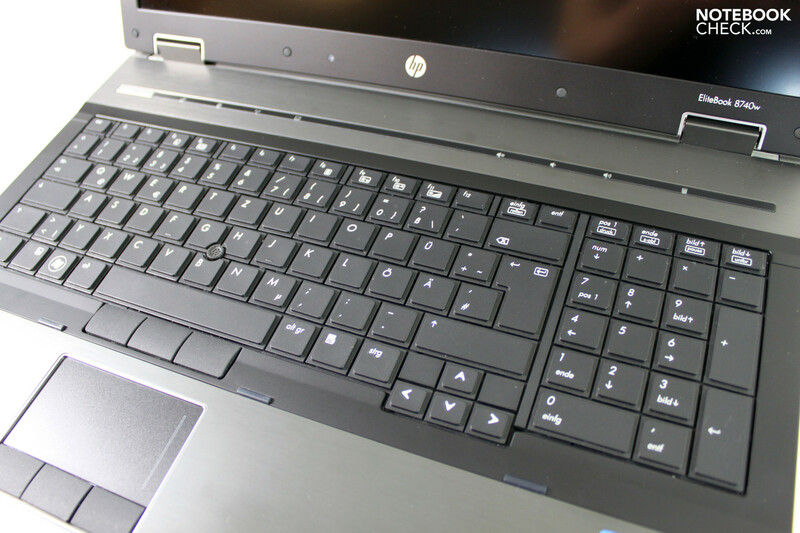 We face the same keyboard as it is used in HP's 8540w and thus also used in a whole range of other business notebooks from HP. The wider base unit is only noticed because of the larger gap between the number pad and keyboard's keys, as well as the somewhat wider case rim on the keyboard's left and right. As usual, the keyboard unit fits tight in the base unit and can only be depressed insignificantly to a part, but doesn't yield as much that the typing feel is affected. The typing feel stands out by a sufficient keystroke length, clear pressure point and pleasant stroke. The quiet soundscape is also agreeable and can even convince prolific typists. A possible reason for reproach could be the missing keyboard light in our model. 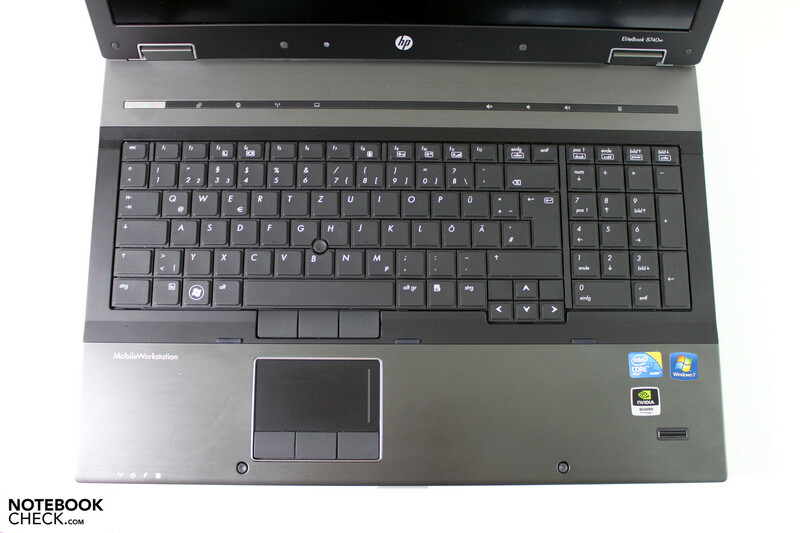 According to HP's specifications, this (key backlight) should be available in selected models. This is definitely a mandatory option if you have to reckon with working in somewhat dimmer surroundings (train, plane, etc.) on the device. 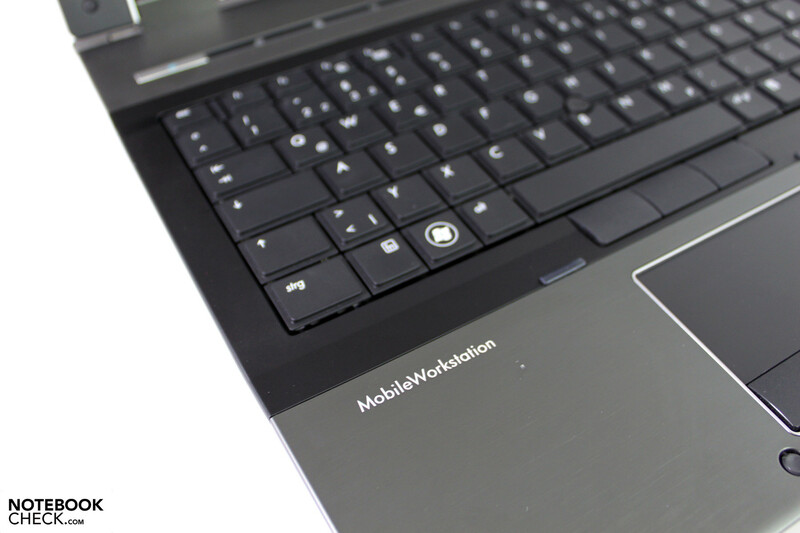 The Elitebook 8740w doesn't only have one, but two different input options for its mobile mouse replacement. 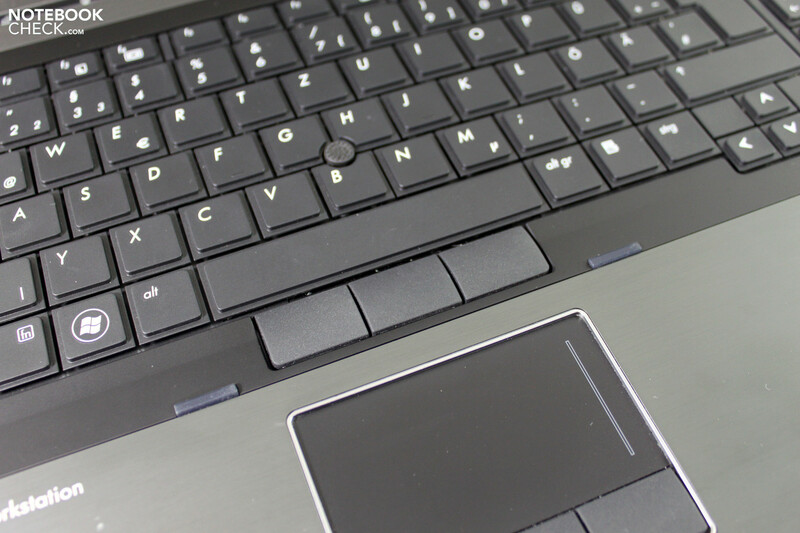 There is the touchpad that is also the same as in HP's 8540w, as well as a mini joystick that looks like a rubber knob in the keyboard's center. Both options allow an effortless navigation even without an external mouse. The Pointstick's advantage is very clear: Readjusting isn't ever necessary to place the cursor in certain positions. With a bit of practice it's even possible to achieve an almost higher inputting speed than with the touchpad. 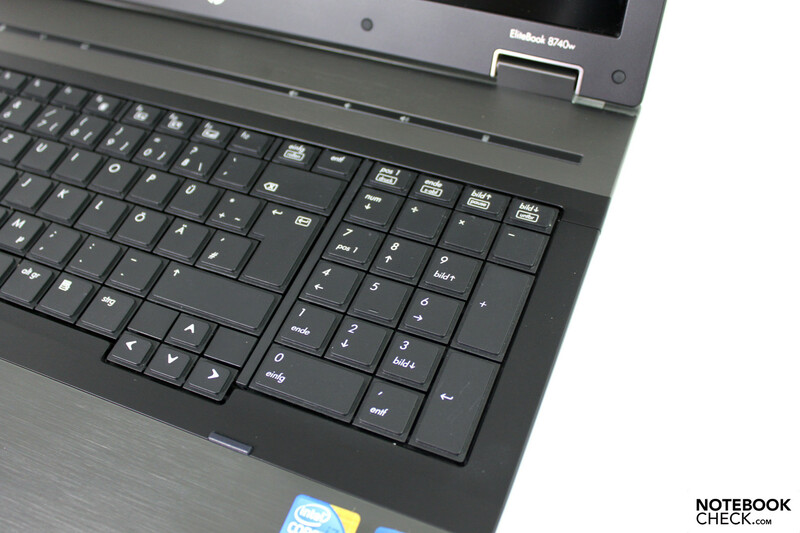 The touchpad bids a pleasant surface with a visibly marked scroll field. Three buttons are found beneath the touchpad, just like the Pointstick, with which all familiar functions can be executed (Synaptics Touchstyk V2.0). Now we come to the highlight of the device at hand, and consequently the main purchase motive for potential buyers: The installed Dreamcolor display. 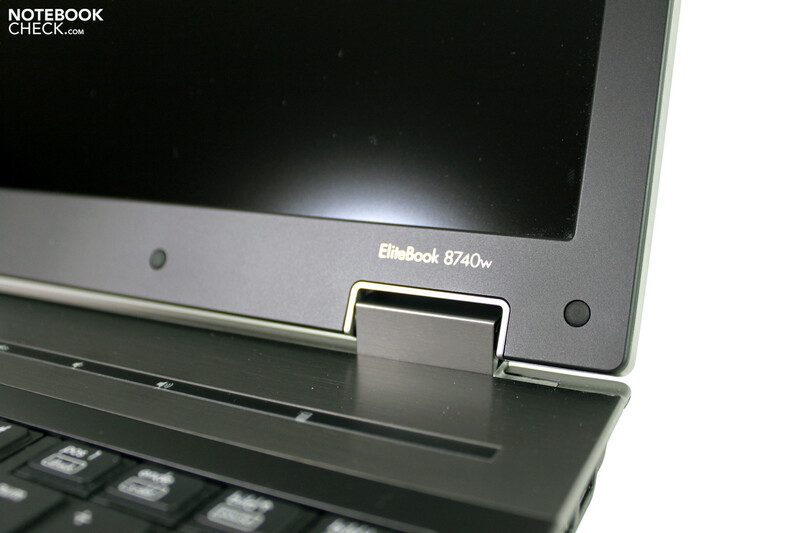 As one of the few notebooks available, an IPS screen is used in selected Elitebook 8740w models. It is a class of its own with top rate viewing angles (see also iPad) and its reproducible color spectrum due to RGB LED backlight. First, we'll look at the standard rates of our display test: HP states a luminosity of 210 nits in its own documentations. We can confirm this manufacturer specification and even surpass it slightly with an average of 213 cd/m2. We can record a maximum of 226 cd/m2, with an only marginal brightness decrease down to 202 cd/m2 in the upper corners. The luminosity is thus a very good 89%. Although the brightness isn't overwhelming, it's more than sufficient for indoor use, even if we would have liked to increase the brightness occasionally. An appealing contrast ratio is rather more important though. We assessed a very low black value of 0.23 cd/m2 and consequently an excellent maximum contrast ratio of 965:1. As if that's not enough, the used display (LGD0270) promises top rates in terms of the reproducible color spectrum with an RGB LED backlight. In fact, in comparison to our colorimeter display measurements, the installed display positions itself at the highest level. The sRGB color space can be covered completely. The Adobe RGB color spectrum even partly bursts the representable color spectrum, according to our measurements. Thus, consumer screens are just as defeated as displays with an extended color spectrum. 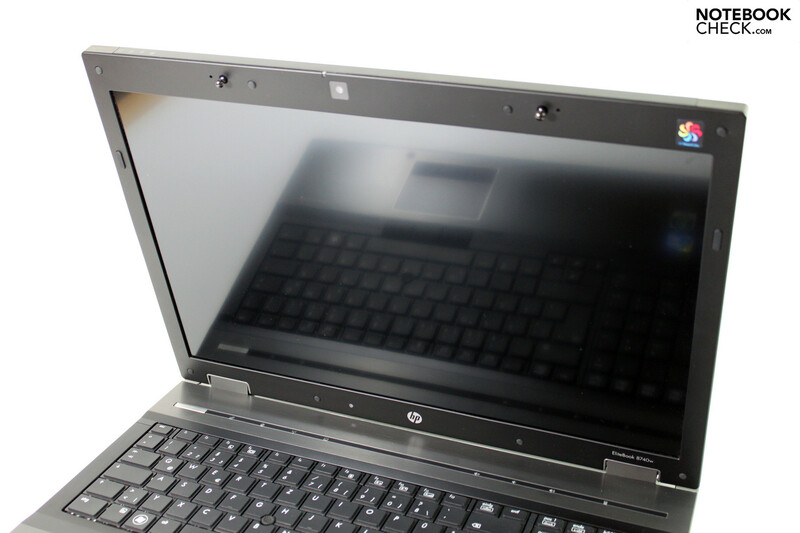 The latter can for example be found in HP's Envy 14 with Radiance display or in the latest Macbook Pros. 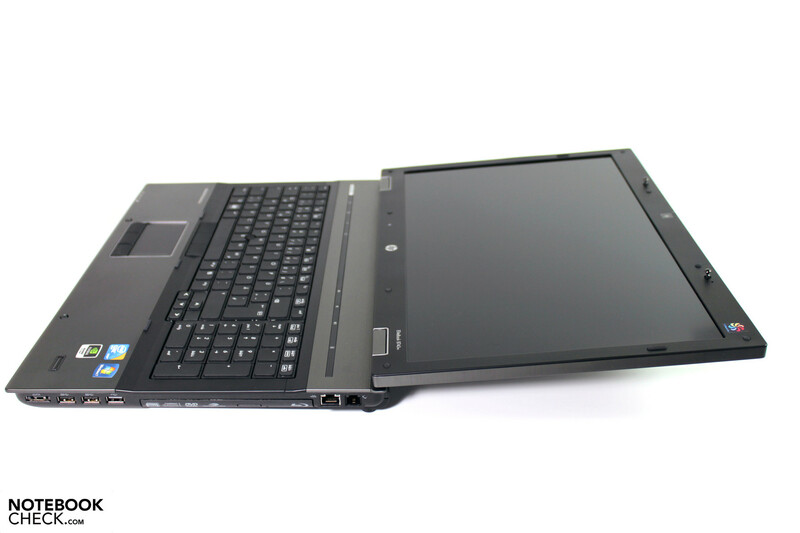 Professional displays, such as the RGB LED screen in the now replaced Dell Studio XPS 16 or even the RGB display in Lenovo's Thinkpad W510, are almost on par with the Dreamcolor display in HP's Elitebook 8740w. The 8740w yet has another ace up its sleeve: The implemented IPS display technology allows extraordinarily good viewing angles. The viewing angles of 89/89/89/89°, measured in all directions from the ideal perpendicular viewing angle, declared in the manufacturer's documentation, sounds like a promotional gag. But it's not. In fact, you can look at the displayed image from almost every awkward viewing position, it doesn't change. Since the regrettable extinction of IBM FlexView displays, this is likely the best display you can currently buy in a notebook in terms of viewing angle stability. In particular, graphic designers and professional photographers can tell a tale or two about standard displays, where the image already suffers badly at the slightest viewing deviation and uselessness for serious applications. We'd like to mention another interesting fact here: A matt display surface is expected, and actually rather mandatory for business devices. 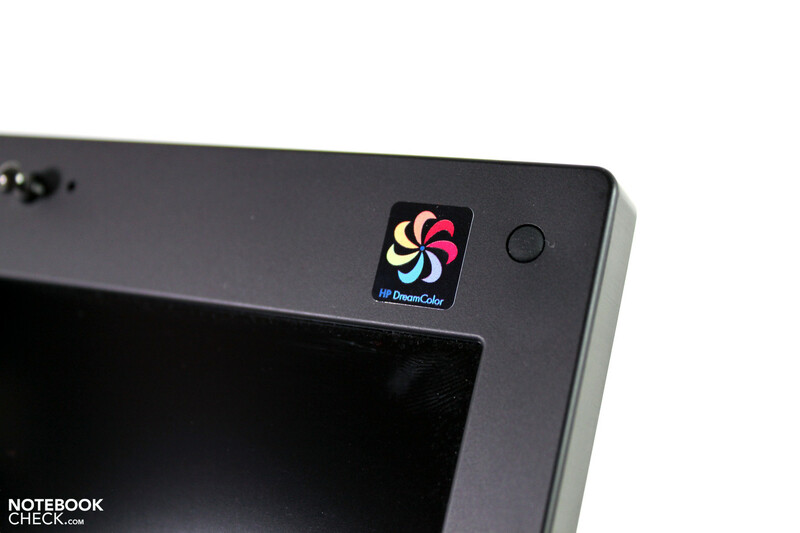 The Dreamcolor screen has a surface coating that tries to merge the best of glare screens and AR coated displays. Although intense reflections are prevented, annoying reflections can turn up in unfavorable lighting conditions anyway. This is because the surface has a fairly smooth surface, even if not glossy. Under consideration of image quality and ergonomics, we believe this is a good solution. A glance at the model range's specifications shows what the 8740w series has been made for: Pure performance. Intel's dual and quad core chips up to the newest, high-performance mobile processing unit, the i7-940XM CPU, are named as possible processors. 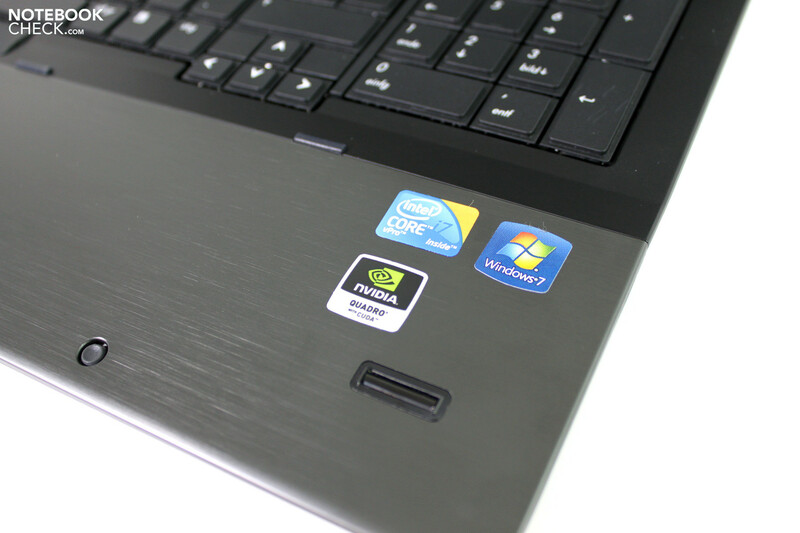 More performance can only be accomplished with desktop processors in notebooks, which however has a severe, adverse impact on mobility. The 820QM CPU installed in our test device is a notch lower, but could almost be boosted to the previous 920XM high-end CPU's level with Intel's Clarksfield Refresh (840QM). The 8740QM doesn't have to hide in terms of pixel output calculation (and now also much more…) either. There are three potent solutions with Nvidia's Quadro FX 2800M, 3800M and ATI's FirePro M7820 as an option. The customer can only rejoice about this, since ATI and Nvidia have shown their special qualities in the single fields. The buyer can configure the most appropriate solution for his personal requirements. If you look around on various price comparison sites, you find the most different configurations in regards to CPU. Interestingly, the i7-820QM installed in our sample can't be discovered, but devices with an updated 840QM CPU and a slightly weaker 740QM CPU. Basically, the buyer has to decide between a dual core and quad core, so a native two, respectively four core alternative. As so often, the workstation's intended application field will be decisive for the purchase. You are best off with a dual core CPU for standard office applications. However, special software can also benefit from the multi core architecture of cutting edge processors. Classic application fields would be, for example, various programs for video editing or also rendering tasks in professional CAD software. When in doubt if a quad core is really needed, you should check with the software provider if a quad core is really a benefit. This problem is complicated even more by the graphics card's capability of supporting the CPU in calculations (CUDA). In this case the GPU provides 96 shader pipelines for calculations and can thus simultaneously process a lot more tasks than the CPU. The Intel Core i7-820QM, just like all other chips of the latest Clarksfield range, achieves this with up to 8 threads at the same time (4 cores + Hyperthreading). In return, the dual core range (Arrandale) can process up to 4 tasks simultaneously (2+2). HP's listed compatible CPU models range from 35 W in i5 and i7 dual cores, over 45W in the i7 quad cores, up to 55W in the available extreme models, 920XM and 940XM in terms of their required cooling performance (TDP). Thus, the 8740w's cooling has to be designed accordingly. Among others, the CPU-biased calculations of Cinebench benchmark tests are apt to find out more about the processor's performance management. In Cinebench R10 (64bit) test, our test device achieved 3709 points in the single core test (computing with only one thread). Entries of the 720QM CPU, as well as the i5-540M and 520M processors are in the immediate vicinity of this in our data base. Thus, the installed 820M CPU scores a bit less than we would have expected. Results of notebooks with the same CPU reach about 3900 points (Thinkpad W510). The 8740w achieves 10252 points in the multi core test. Processors, alike the 720QM, with a better performance are also found here. Even the refreshed 740M CPU can place itself before the 820QM. Merely the upgraded 840QM version can restore the order and with up to 12000 points, places itself behind the 920XM (about 13300) and 940XM chip (about 14100 points). The score looks similar in Cinebench R11.5 (64bit). The 8740w is in the area of devices with a 720QM/740QM processor with 2.95 points. 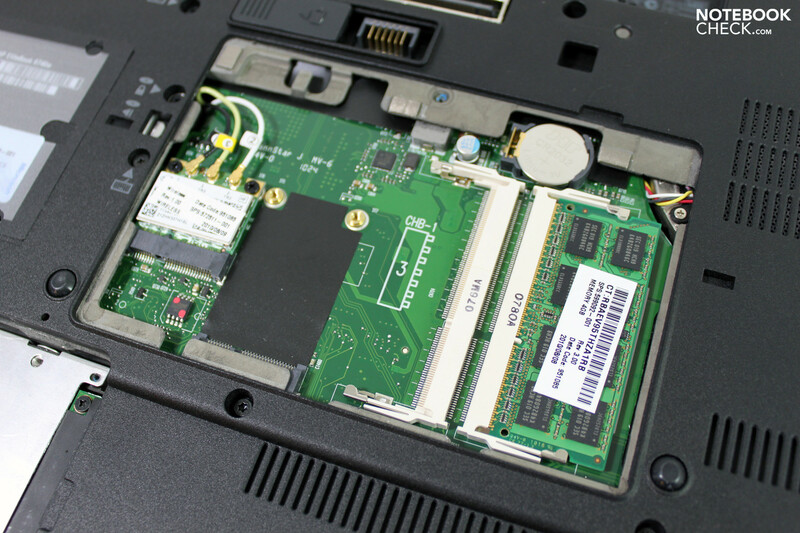 Previously tested 820QM notebooks only have an insignificant lead (Thinkpad W701ds). Although our test device has a throughout very strong graphics card in the way of an Nvidia Quadro FX 2800M, it isn't the strongest available alternative (Quadro FX 3800M). The 2800M is about on par with the 9800M GT consumer graphics solution from Nvidia and is also comparable in terms of architecture. The ATI Radeon HD5850 or the Nvidia Geforce GTX 260M, respectively the GT 445M are on about the same performance level. The Quadro FX 2800M is optimized for professional applications (CAD, visualizations, etc.) due to specially modified and certified drivers. It supports DirectX 10 and OpenGL 2.1 because of its older architecture. 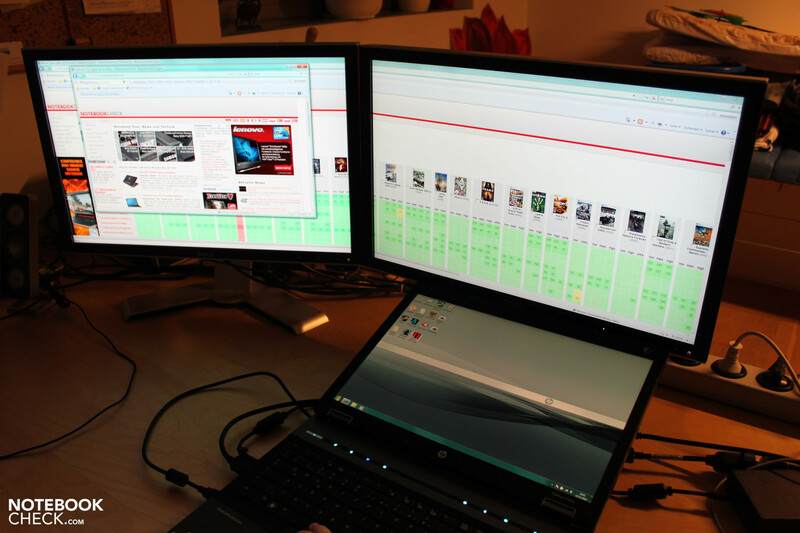 Beyond that, the GPU can address external displays with a resolution of up to 2500x1600 pixels via the display port. 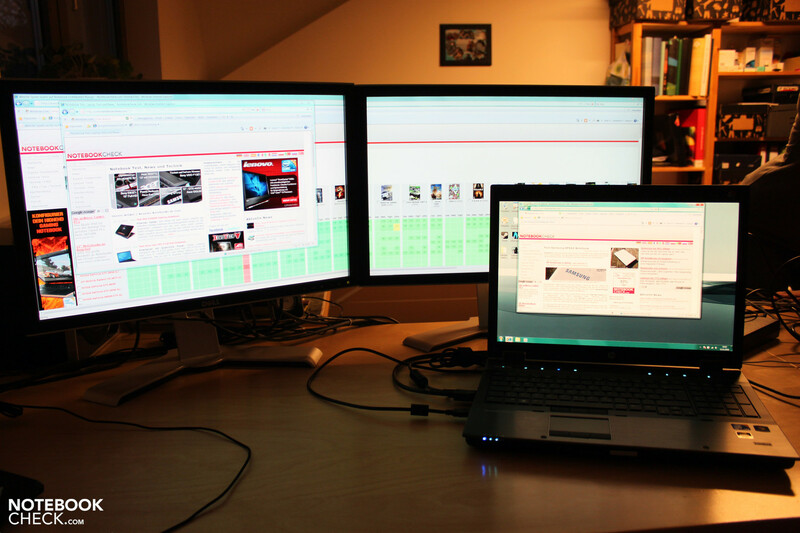 This, for example, allows the 8740w to be used with large screens or with multi-monitor setups (see above). The most important parameter for the graphics card's performance capabilities of professional applications is its OpenGL performance. The performance reserves can also be deduced via the OpenGL Shading Test from Cinebench R10 and R11.5. Cinebench R10 gives the 8740w in this configuration with 5156 points in this test. 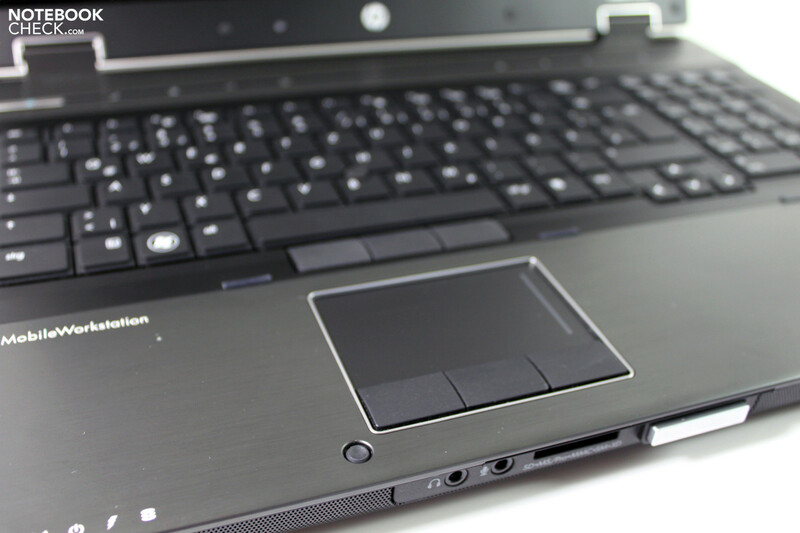 Thus, the 8740w positions itself on the same level as many notebooks with ATI'S HD 5650 or HD 5850 graphics. The FX 880M graphics solution, found in the previously tested smaller HP 8540w (4626 points), lags far behind. Just as surprising, the actually same FX 2800M in the reviewed Thinkpad W701 is also left behind (4662 points). The test device achieved 29.36 frames per second in the more recent Cinebench R11.5 OpenGL benchmark test. Once again, HD 5650 and HD 5850 notebooks, as well as GTX 285M SLI graphic solutions are on a comparable level. The Thinkpad W701 with the same graphics lags a bit behind, the HP 8540w with ATI's FirePro M5800 GPU is also equally defeated with 21.8 fps. The 8540w with Nvidia's Quadro FX 880M graphics lags even further behind (16.1 fps). Futuremark's 3DMark can also rate the performance reserves of 3D representation. However, it's not as expressive for a graphic solution designed for professional applications, but rather more aligned for gaming in this case. Our test system achieves 11555 points in the 3DMark 2006 benchmark test (1280x1024) and thus places itself in the vicinity of notebooks with GTX 280M graphics (mySN XMG7.c) or Geforce GTX 460M (Asus G73JW). The 8740w achieves 5779 points in the latest 3DMark Vantage benchmark test. 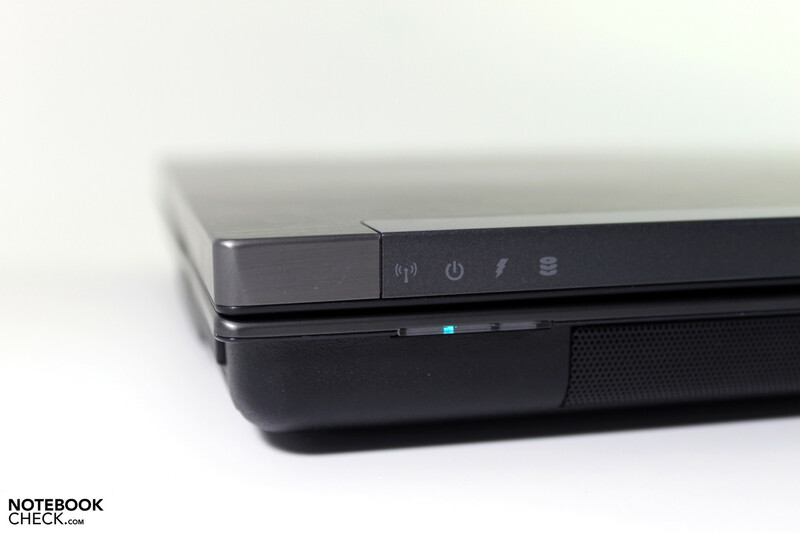 The Thinkpad W701 with the same graphics practically scores alike. The SPEC Viewperf benchmark, test version 11.0, allows an evaluation of performance reserves in view of actual applications. 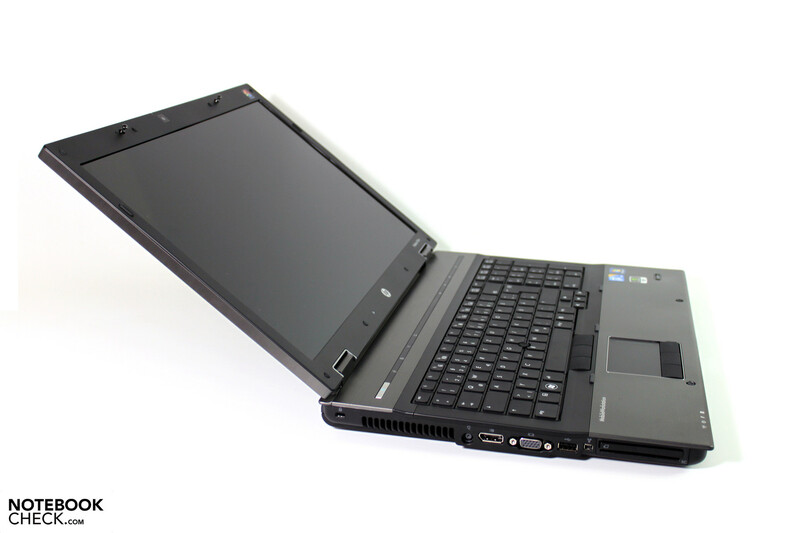 The test result is throughout surprising: The HP 8740w, in the configuration at hand and with the pre-installed drivers (8.16.11.8918 / FW 189.18) stays considerably behind the results of the similarly equipped Lenovo Thinkpad W701 and even behind the 8540w from HP (FirePro M5800) in many ratings. The 8740w is about on par with the mentioned competitors in Tcvis, Pro/Engineer and Catia. The differences in SolidWorks, Maya and Lightwave are striking. The last stop in the World of Benchmarks is the PCMark Vantage benchmark test, which checks a system's overall performance. The workstation immediately places itself amongst the top entries in our data base with 7159 points. The good score in practically every single test, starting with the memory, over gaming up to hard disk, is responsible for this good rating. HP favors 7200 rpm drives for the mass memory. Solid state drives are optionally available. They would revise PCMark Vantage considerably upwards, and the subjectively perceived work speed would also be increased, in spite of the already very good level. The installed Scorpio Black WD5000BEKT hard disk from Western Digital in our test sample bids a gross memory capacity of 500GB at a revolution speed of 7200 rpm. The recorded rates in the HDTune and CrystalDiskMark test are throughout in the expected range and show slight speed advantages in comparison to standard 5400 rpm models. The HP 8740w remains on a consistently quiet level in operation without load (idle), respectively undemanding office applications. The fan is quietly audible in the background, but only develops a noise level of 33.4 dB(A). The workstation remains inconspicuous even in quiet office environments in this state. When the workstation is put under load, the fan reaches a level of 42.4 dB(A). Thus, it's clearly audible, but can be described as just as unobtrusive due to the muffled whirring soundscape. We reach a, for the long-term, unpleasant level of 49.7 dB(A) first in the stress test where CPU and GPU are put under load. 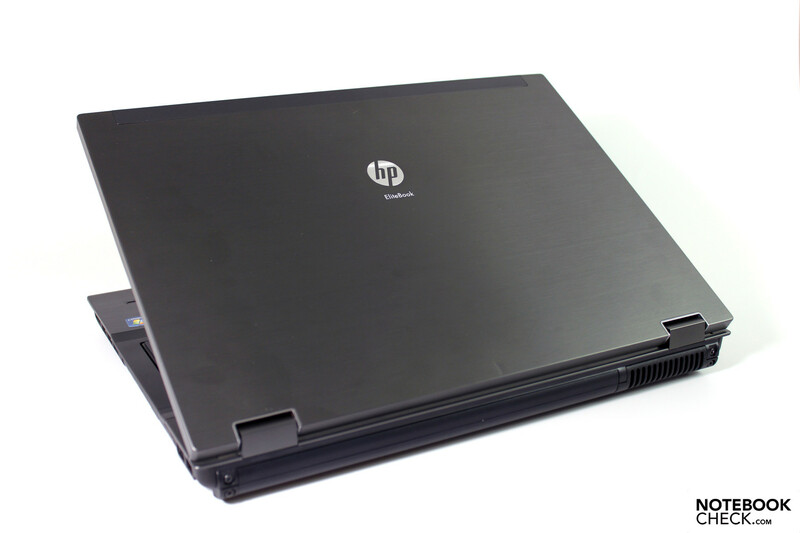 The HP Elitebook always stays cool during average office usage. The wrist-rest remain almost cool with up to 27.9°C, while the maximum temperature measured on the top also is very low with 32.3°C. The base unit's bottom only heats up slightly more and reaches up to 36.6°C in this operating state. In the "worst case" scenario, that is the stress test of several hours, the highest temperature on the base unit's upper left corner increased to a maximum of 44.1°C. The wrist-rest area still remained relatively cool with up to 28.8°C. The bottom heated up to 46.4°C, which is just as acceptable for such a strong workstation. A look inside of the device also didn't reveal any critical rates. The CPU reached a maximum of 90°C after an hour of load and settled just below this rate. The graphics card also remained at an uncritical 78-79°C and didn't show any tendencies for performance loss caused by overheating. (±) The average temperature of the palmrest area of similar devices was 27.8 °C / 82 F (-1 °C / -1.8 F). You would basically believe that the battery life is rather insignificant for big and especially strong notebooks. This may also be true in many cases. Nevertheless, HP tries to go its own way. We found an 8 cell battery, with a capacity of 68 Wh, in our test sample. This is more than usual for an average multimedia notebook. But it's only enough for a limited mobility in a workstation. We assessed a maximum possible battery life of 111 minutes under favorable conditions (BatteryEater's Reader's; min. brightness, comm. modules off, energy savings mode). It can get even tighter when the notebook is loaded without a direct line to the mains. The 8740w only lasted for 50 minutes in BatteryEater's Classic test (max. brightness, comm. modules on, high-performance profile). You might be thinking: "So where is HP's individual course?" – In the accessories. Two external battery solutions are offered for the largest workstation in the collection (link). They can be strapped to the base unit's bottom via an own interface. There is a 12 cell battery pack with a weight of about 0.8 kilograms and a capacity of 95 Wh (about 150 euro) or a somewhat weaker option, an 8 cell battery pack with 52 Wh and 450 grams (street price of 80 euro) available. The battery life they reach can extend the recorded rates accordingly (+75% up to + 140%). The documented energy requirement doesn't leave a doubt about the strong hardware installed. 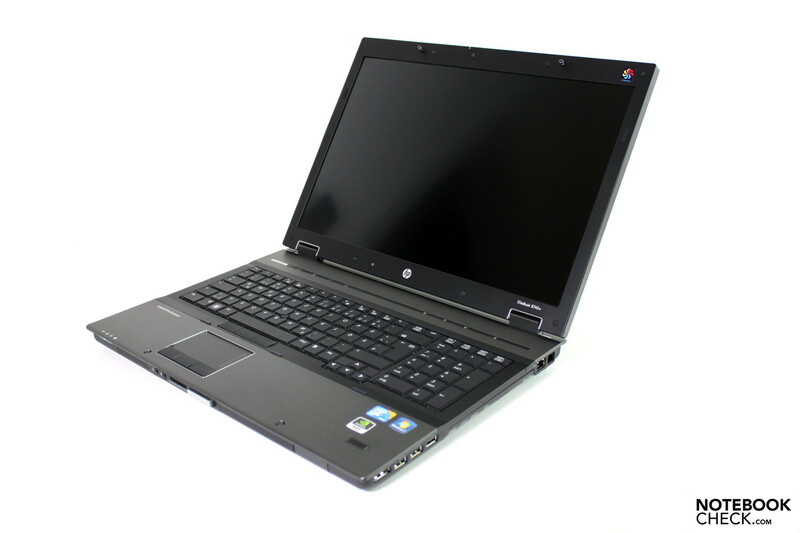 The notebook treats itself to about 30 to 50 watts without significant load in idle or office mode. The power consumption increases under load and reaches its climax at about 155W under CPU and GPU load. It is accomplished. 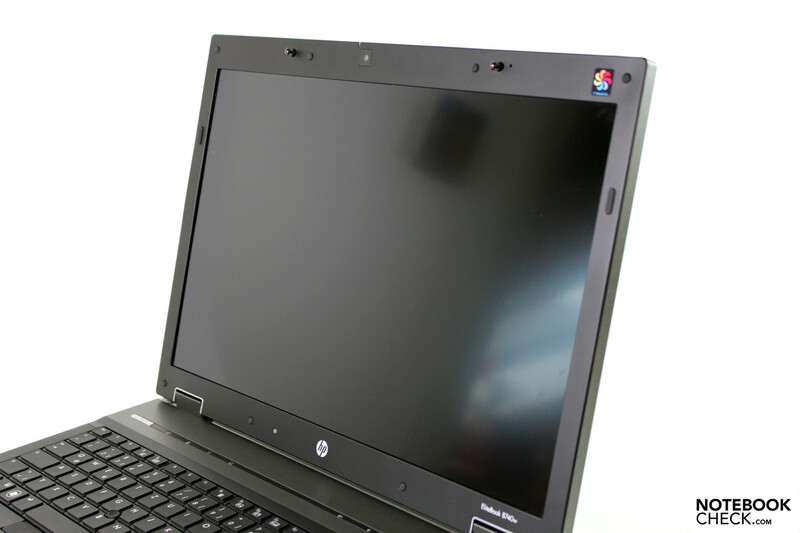 HP's top model of the business range has successfully completed our tests. The result: Remarkable. 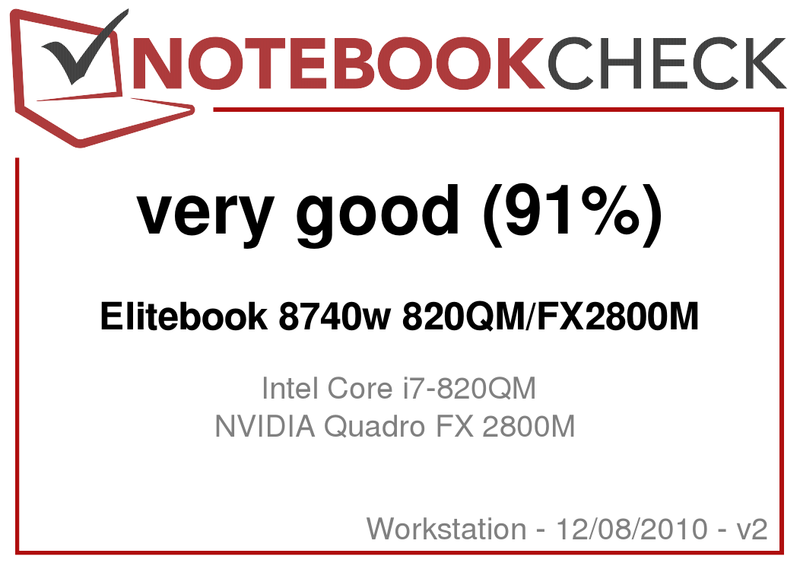 The HP Elitebook 8740w clearly illustrates the limit between a "very good" and a just "only" good device. Once again, the notebook's most essential advantages and drawbacks in a brief review: The case proves to be very solid and remains very unobtrusive in terms of looks. It is also surprisingly slim in view of the possible equipment. The given ports bid a more than comprehensive array in terms of connectivity. However, the positioning isn't quite perfect in certain conditions, in particular in stationary use without a docking solution. The input devices, especially the keyboard, are inviting for typing and navigating. External solutions won't be used, above all during mobile use. The highlight of the version we tested is doubtlessly the high resolution Dreamcolor IPS display. It can particularly score with an excellent image contrast and an especially large color spectrum beside its good rates. In terms of the given viewing angles, we would consider the installed screen as a reference for the currently at most possible in mobile devices. The performance is right, and can be perfectly modified to suit individual needs with numerous configuration alternatives. 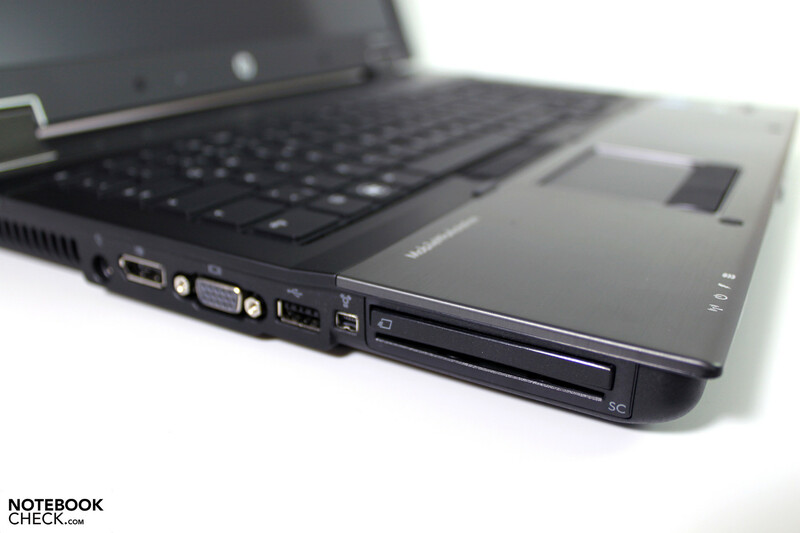 From basic office up to high-end workstation, everything is possible for the HP Elitebook 8740w. Beyond that, the version with Intel's 820QM CPU and Nvidia's Quadro FX2800M graphics that we reviewed could especially score with low noise and heat emissions. Naturally, it's possible that these rates deviate in a different configuration, or with stronger components. This also applies to the battery life, which you basically shouldn't expect too much of though. 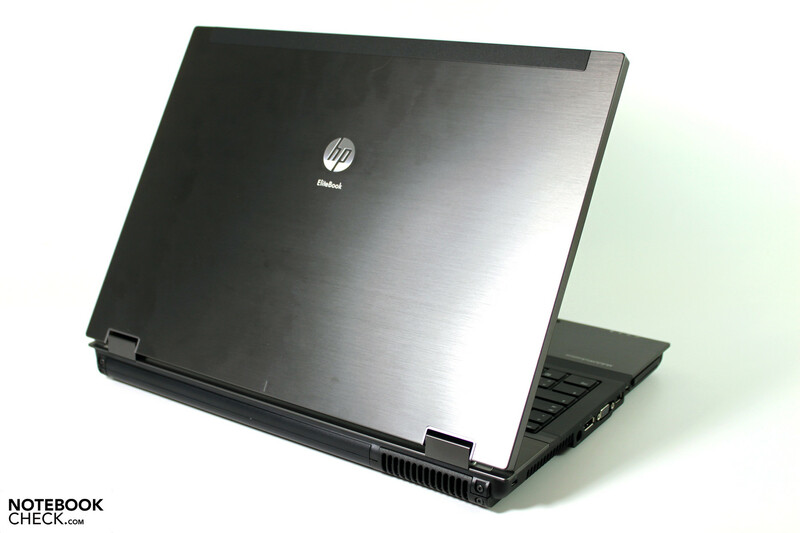 Nevertheless, HP has surcharge liable extensions that could give even this 17 inch workstation a feasible battery life. The HP Elitebook 8740w range will likely not come in question for private users, even if the entry price starts at about 1700 euro (dual core). However, if the Dreamcolor display is on the equipment wish list, you'll have to reckon with a leap to 3000 – 4000 euro, and depending on the configuration perhaps even more. Clearly, the IPS display. Top rate contrasts, large color spectrum and almost unlimited viewing angles. What more could you wish for? Perhaps a bit more brightness? Little. Soonest a second hard disk bay for RAID configurations without having to sacrifice the optical drive. That really good screens are still hard to find in notebooks. Actually, there are only two model ranges that could pass as serious competition for the 8740w – first of all, the Lenovo Thinkpad W701 and second, the Dell Precision M6500.